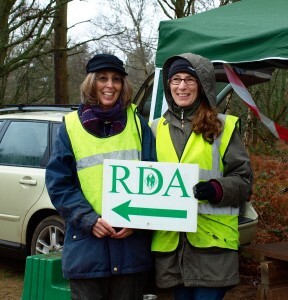 Our Volunteers are an essential part of Cranleigh RDA, without them we couldn’t possibly function. Anyone over 14 years old may become a volunteer, training is given to everyone who joins the group and you can do as little or as much as you feel capable of. We have volunteers from a diversity of backgrounds and ages who bring their talents and enthusiasm to contribute to our team. The most important quality that a volunteer must have is the ability to work in a team. Volunteers aged 14 to 25 can receive recognition for their time and commitment by working for their Young Equestrian Leaders Award. Most sessions are about 2 hours long and fit within school hours so those with family commitments can get back for school runs, etc. Our sessions run weekly during school term time only and it is not necessary to commit to every week, although it’s great if you can. All our volunteers (with the exception of Duke of Edinburgh and YELA students) are required to undergo a DBS check and references will be taken up. For more information please email volunteercranleighrda@yahoo.com.